Poet, Chris Rife, reads his poem “I Bought Myself Some Flowers” as others listen. It was a rainy summer solstice for us here in Chicago, but we made the very best of it at Big Chicks in mid June. 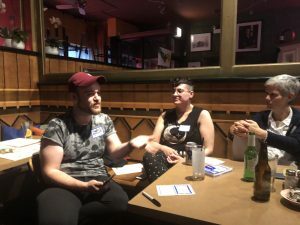 KPACT members, Lifeworks therapists, and a roster of queer poets gathered at Big Chicks to share art and raise some funds for the National Coalition of Sexual Freedom. We were a small but mighty crowd and we managed to raise money while enjoying each other’s company and the talent of our readers. We were also lucky to hear the work of J Graber, who hadn’t shared her writing in over five years. She decided that the KPACT Kickback was the perfect time for her comeback. The poems she shared crackled with dry humor, and explored themes like transgender love, life, and friendship. RE Katz, who works as a Principal Storyteller for the Illinois Board of Education, also shared some of their work, including poems from a chapbook they’re currently shopping around to publishers. “I sometimes feel as is there isn’t enough room in this world for poetry,” they said. “That’s kind of how it feels to be queer sometimes, too. I’m really glad that this event has made space for me.” Click here to read RE Katz’s poem “Four Imagined Early Deaths”, shared a the Kickback in June.